Tony Costello at Built 4 Speed Tattoo is taking over the tattoo scene in Orlando! The word tattoo has a lot of meanings for different people. Some people think of all the possible pain they will experience, some will be frightened due to their fear of needles, and some think of it as a waste of time and money. For me, I think of an outward expression of my thoughts, and the stores that goes into each of the tattoos that I have on my body. As many of you know, I was raised in Northern Virginia however my heart is in Orlando. I love this city and especially love my website! 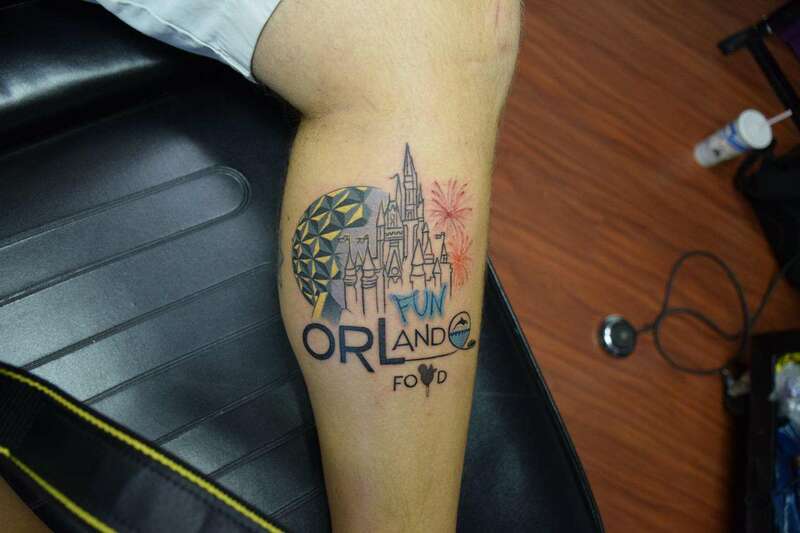 Naturally due to my love for tattoos, I sought out someone who did amazing work here in Orlando to design and do my Orlando Fun and Food tattoo. After asking around friends, and looking at reviews online they all pointed to one person: Tony Costello. Tony Costello has been tattooing professionally for over 10 years but started his trade back when he was a teenager. 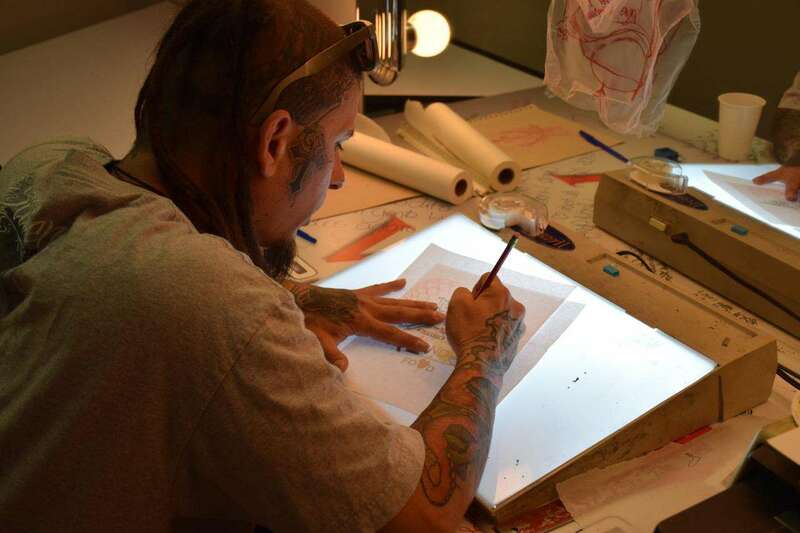 For Tony, his love for drawing and the art of tattoos just made sense. 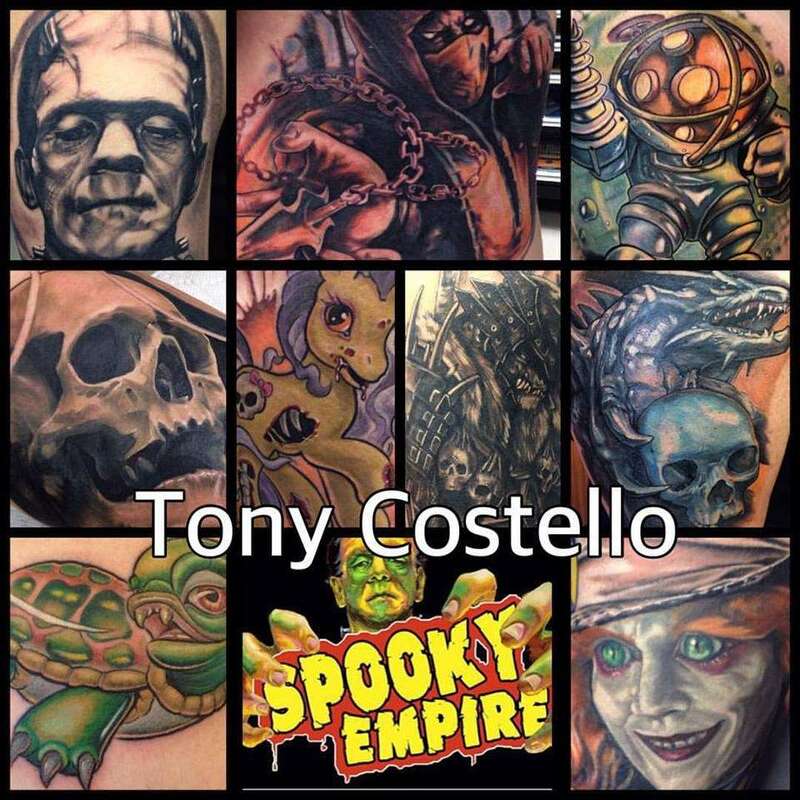 Now, Tony Costello works as a tattoo artist touring the US to different shops, conventions, and expos. 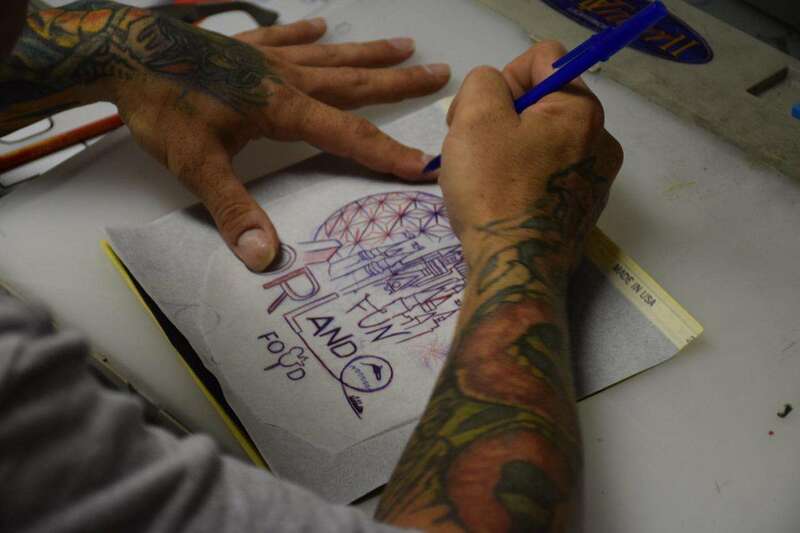 Nowadays you can find Tony Costello tattooing out of a tattoo shop called Built 4 Speed Tattoos in Orlando. When I approached Tony about my tattoo idea I told him what I wanted to do. I wanted to incorporate both my logo and my love for Walt Disney World, especially the symbols of both Magic Kingdom and EPCOT. One thing I love about getting tattoos from amazing artists such as Tony, is their ability to take a simple idea or direction and let them run with it. 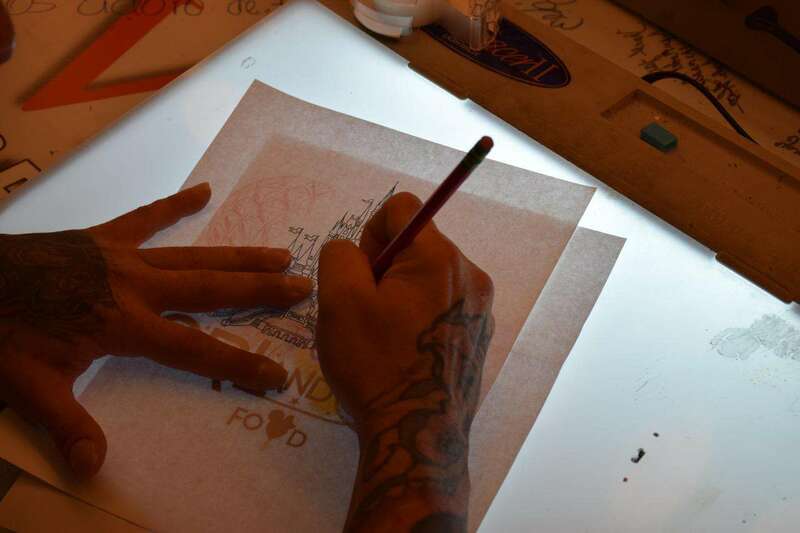 Tony sat down at his table and began to draw up my tattoo, doing just what I asked combining my logo and Cinderella Castle and the EPCOT Geosphere into an amazing tattoo design. Once he was done drawing it up I knew that I had to get it that day! Before I knew it, my leg was shaved, the stencil of the design was on my leg and we began. For me, tattoos do not hurt but are actually somewhat soothing. Tony does a great job at making sure the tattoo was done professionally, and that safety and health was top priority! After a few hours and a few breaks my tattoo was done!! I love how the logo and the geosphere really stuck out! I highly recommend checking out Tony Costello the next time you are looking for a tattoo!! He does some amazing work and he was extremely professional! He also runs some specials from time to time so make sure you check those out as well. Tony will be apart of both Spooky Empire as well as the Kink Festival coming up next month at the Central Florida Fairgrounds! You can also contact Tony via text or phone call at 407-314-5807! Make sure you tell him Jason from Orlando Fun and Food sent you!! Previous Post Tickets To Ringling Bros. and Barnum & Bailey Presents LEGENDS On Sale Now! Next Post Light Up UCF Set For The 2015 Holiday Season!